By evaluating XRF, ICP-OES, and ICP-MS analytical technologies, users can obtain airborne particle analysis that’s rapid, reliably, accurate, and surprisingly affordable. Air pollution is a continuous concern worldwide. The harmful health effects of human exposure to heavy metals (such as lead, arsenic, or cadmium) absorbed into particulate matter and carried through the air is of particular interest. These particles are principally generated by processes such as combustion. The health and safety monitoring and analysis of the elements present in these airborne particles are performed by industry and environmental protection agencies, as well as research institutes and testing laboratories. Over time, a number of spectrometric technologies have been employed. Each has its own pluses and minuses, and the technologies have evolved and improved over the years. Atomic absorption spectrometry (AAS) was once commonly employed for air filter analysis. While often still the most affordable solution per initial purchase price, AAS may suffer from limitations including low dynamic range, chemical interferences, sequential operation (and associated relatively low throughput), safety risks when left unattended, recurring lamp replacement expenses, and the need for frequent recalibration. Thus, other technologies have increasingly replaced it. Photometers were also used fairly frequently. But these suffer several disadvantages, such as low accuracy for high concentrations, the necessity of more extensive sample preparation, and the lack of simultaneous screening for all targeted elements. With the advent of the better technologies shown below, photometric analyzers are probably more suitable for measuring alkali metals than the toxic heavy metals most of interest in air particle analysis. Today, the most commonly used technology for analysis of airborne particles involving inductively coupled plasma (ICP). Depending on desired detection limits — and whether local regulations demand a specific choice — these are inductively coupled plasma mass spectrometry (ICP-MS) and inductively coupled plasma optical emission spectrometry (ICP-OES) instruments. Finally, XRF spectrometers are increasingly popular — especially energy dispersive X-ray fluorescence (ED-XRF) models. Table 1 shows the advantages and disadvantages of each spectrometer type. ICP-OES, ICP-MS, AAS, and photometric analyses all require sample preparation. Filters are placed in vials or other containers, and are mixed with digestion reagents (usually nitric acid plus hydrofluoric acid or hydrogen peroxide). The resulting liquid with suspended solids is then heated on hotplates, in a microwave digestion system or in hot blocks for extended times, until the particles are digested. After appropriate dilution the sample can then be introduced into the analyzer. By contrast, XRF analysis requires no such lengthy pretreatment. The loaded filters themselves are simply placed into an analyzer’s appropriately sized sample cup. (If required, filters may first be cut to size.) This provides rapid results and noticeable ease of use. After calibration — with liquid standards for ICP, or available reference filters with XRF — analysis can begin according to the given instrument's method. 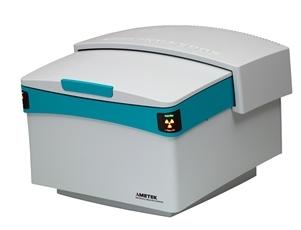 Modern ED-XRF analyzers are increasingly utilized for airborne particle analysis. For most uses, they are often now regarded as the easier and quicker solution when compared to ICP technologies. ED-XRF instruments allow nondestructive sampling plus relatively fast, simple sample preparation, without the need for preheating or chemical digestion. This enables quick analysis — even by relatively inexperienced laboratory personnel — while minimizing the risks of contamination or element loss. ED-XRF also offers lower operating costs com­pared to ICP. It uses no expensive argon gas, consumes less electricity, and needs fewer supplies. Thus, the latest ED-XRF analyzers can provide fast, precise, accurate, and economical solutions. Some limitations of traditional ED-­XRF technology made it difficult or impossible for these analyzers to measure certain heavy metals such as cadmium. They simply couldn't muster sufficiently low detection limits. However, scientists and manufacturers have made improvements to ED-XRF methodology and to some instruments. So for the most advanced units, limits of detection and analytical capabilities using ED-XRF have caught up with — and may now even surpass — regulatory requirements. For contract environmental and industrial laboratories, local regulations may prescribe which technology must be used. 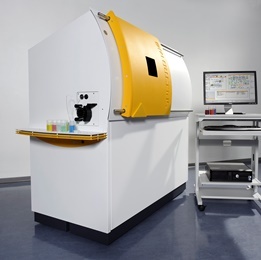 When it comes to research laboratories, which typically are free of regulations mandating particular technologies, some prefer the nondestructive analysis offered by ED-XRF. Others are looking for trace elements or high-volume use and often prefer ICP-OES or ICP-MS. In terms of disadvantages, note that only quite advanced ED-XRF units offer analysis of heavy metals. Many models utilizing traditional ED-XRF technology still lack sufficient detection limits for certain elements of interest: principally cadmium. That said, one example of an industry-leading ED-XRF analyzer addresses the shortcomings of other instruments with an innovative 50 W / 60 kV X-ray tube, an improved high-count rate detector, and unique adaptive excitation technology. So it can furnish previously impossible sensitivity boosts of up to 10X over previous models, optimized to target element groups of the user’s choice. This makes it an analyzer that can actually deliver limits of detection low enough (down to less than one part per million) for heavy metals — until now, beyond the reach of ED-XRF technology. Modern ED-XRF analyzers are probably most suitable for smaller laboratories or other operations that require modest volumes of air particle analysis to be performed quickly and easily. Larger laboratories with heavy air particle analysis loads requiring the highest throughput may instead consider ICP-­OES models. The toxic heavy metals of most concern for airborne particle analysis are well within the limits of detection for these analyzers — a critical advantage when trace amounts of elements must be analyzed. Additionally, a good ICP-­OES spectrometer can conduct a high number of sample analyses in relatively short time. This technology may prove the ideal choice for larger laboratories that require the highest throughput, and that may conduct occasional air particle analyses as part of a larger menu of analytical tasks. Note that ICP-OES is destructive of the sample. It also requires sample preparation with heating and digestion. And compared to XRF instruments, it incurs higher operating costs for argon, power, reagent supplies, and more. Also, most (but not all) ICP-OES analyzers rely on a conventional optical approach, utilizing two-dimensional detector arrays and diffraction gratings of the echelle type. Unfortunately, this technology can suffer from lower light throughput and stray light, plus interferences and overlaps especially in line-rich spectra. For certain elements in certain circumstances, these can diminish overall analyzer sensitivity, resolution, and stability. Instead, one of the industry-leading analyzers use an innovative Optimized Rowland Circle Alignment (ORCA) design. Avoiding two dimensional detectors, ORCA systems take advantage of modern linear detector performance. They incorporate arrays of charge coupled device (CCD) linear detectors optimally fitted to the focal curve. Using curved mirrors, with a concave grating arrangement optimized to limit light loss during diffraction, results in sensitivity and uniform resolution over a wide spectral range, plus exceptional stability. Also unfortunately, there are still ICP-OES instruments that operate on a sequential basis: having to analyze each element in a sample one at a time. Such instruments lack the ability to capture the entire spectrum with each analysis. This handicap can further increase analysis times. It also prevents users from archiving complete data for later study and/or regulatory compliance proof. Industry-leading instruments address this shortcoming by analyzing the entire relevant emission spectrum of a sample using two simultaneous measurements to provide high-speed analysis as well as to archive a complete record of airborne particle analyses for later study, or for proof of regulatory compliance — allowing later screening for elements that weren't initially analyzed. In a significant advantage, most ICP-MS analyzers demonstrate at least 10X the sensitivity of ICP-OES units, with much better limits of detection for elements of interest in airborne particle analysis. Most ICP-MS systems perform sequential analysis only. They must analyze for each isotope one at a time, which naturally leads to longer total analysis times. The long time required to capture and record the entire mass spectrum typically forbids to do so, leading to gaps in the record. However, a few newer ICP-MS analyzers don’t suffer from this limitation. ICP-MS is destructive of the sample. It's also the most expensive of the technologies considered here. Typical instruments may cost approximately twice as much as ED-XRF models for initial purchase, and their greater operating costs include digestion reagents, etc. Several analytical methodologies address the growing needs of industry and regulators for analysis of airborne particles. With care to select modern analyzers that exhibit the right technological innovations and features, users can obtain airborne particle analysis that's rapid, reliably, accurate, and surprisingly affordable.